Moghrabieh or what is known as Lebanese couscous for many, is the name of small white dough balls. It is used in a Lebanese dish called after it made with meat or chicken and chickpeas with specific spices. Moghrabieh’s best feature is its capacity to inflate and hold aromas; the more it is soaked in something the more it will engorge in its flavor. So what you see as little balls in the beginning can turn into soft, chewy pearls with the taste of all the ingredients accompanying them. There is not a lot of documentation for it online, although it has several appellations and spellings. One I saw on a vegan blog is what I liked most: Pearl Couscous. 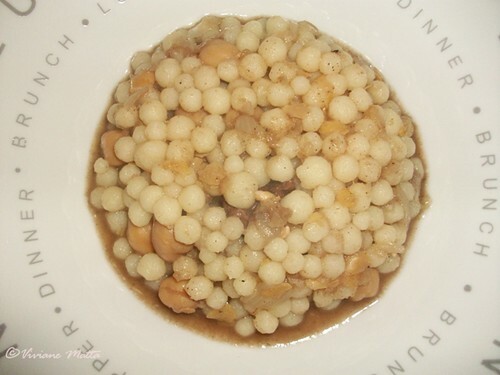 Although searching Pearl Couscous does not yield in much information, it just points out recipes that might include other kinds of couscous, which all are different from Moghrabieh. Moghrabieh comes in two forms: steamed or dry. The steamed kind is ready to cook immediately while the dry kind needs to be steamed before being cooked. It is usually done while making the Moghrabieh base sauce, on top of the boiling pot, in a steamer or colander. This way the vapors get inside the little white balls pumping them up with more flavor. I am afraid I am going to base this ingredient’s information based mostly on what I know of it, because of the lack of documentation. I am not even sure of what these balls are made of, or how they are shaped into balls. You can read about couscous history on this link. For a Moghrabieh recipe follow this link.